Oxford Properties' RBC WaterPark Place is one of two of its towers in Toronto to test different rate structures for charging electric vehicles. 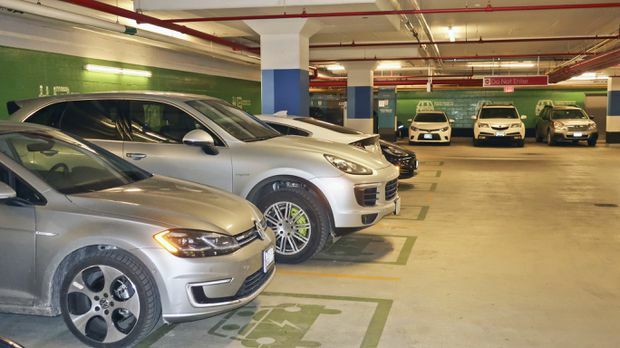 The spaces at WaterPark Place in Toronto are colour-coded green to clearly indicate EV charging spaces, one solution to the problem of gas-powered vehicles taking the spots. 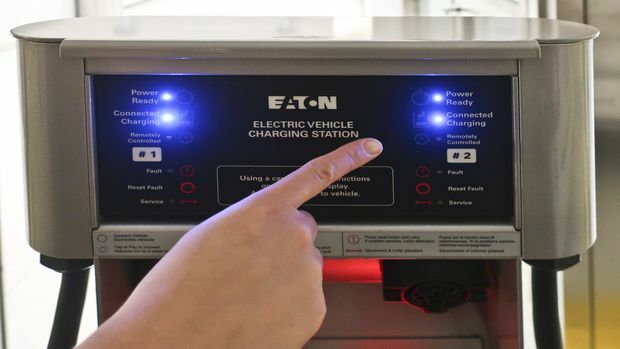 The control panel of a plug-in station will go dark when charging is done, signalling to motorists or attendants that the car can be moved to another stall. In British Columbia, where EV vehicle populations are growing the fastest, the province has taken the lead in installing charging stations. There are now more than 1,000 Level 2 chargers at stations across the province that will fully charge most vehicles in fewer than five hours. And there are 50 B.C. Hydro-installed DC Level 3 chargers that will do that same job in 30 minutes or less, plus a small network of Tesla superchargers for use by Tesla owners. 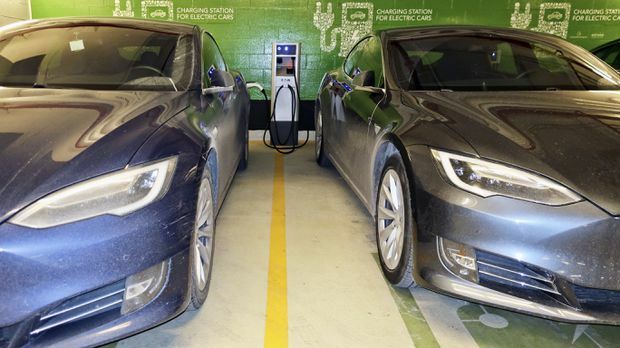 The City of Vancouver’s building code bylaw was updated in March of 2018 to require that new commercial buildings have at least 10 per cent of parking stalls wired to be ready for EV charging. Plug In BC’s workplace charging incentive provides companies and building owners with government funding to support the installation of workplace charging infrastructure. The program is open to B.C. registered businesses, building owners, managers, or other building representatives. The incentive covers 50 per cent of total project costs, up to $4,000 per Level 2 station. Three new rebates, financed with $1.85-million from the British Columbia government as part of its clean energy vehicle program and administered by Plug In BC, an EV advocacy group, are available through March 31, 2020, although the program could end sooner if the funding runs out, the group cautions. Ontario cancelled the cap and trade program to bring gas prices down and, it says, help lower costs for Ontario families and businesses. As a result, on July 11, 2018, the electric and hydrogen vehicle incentive program was cancelled. Quebec has a provincial program to reimburse up to 50 per cent of the costs of installing commercial charging stations. The program expires at the end of 2020. Approximate number of plug-in cars registered in Canada to date. Average annual percentage increase in electric vehicle sales in Canada over the past five years. Percentage increase in EV sales in the third quarter of 2018 compared to the similar period a year earlier. Percentage of all new passenger car sales in Canada that are electric powered. The ratio of all-electric cars to gas-electric hybrids sold in Canada in 2018. Percentage of new car sales that are EVs in Ontario. Percentage of new car sales that are EVs in British Columbia. Stats from FleetCarma.com based on third quarter of 2018 registration data compiled by IHS Markit (formerly R.L. Polk & Co.).